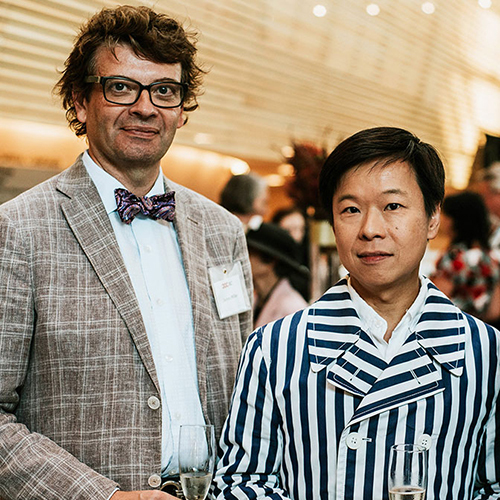 Eric Tang (right) and his husband James Miller (left) are long-time President’s Council members. Eric recently shared with us some of his favourite productions, what made him decide to become a COC donor, and why he thinks you’ll like opera if you’re big on Netflix dramas. Tell us a bit about yourself! What do you do for work? I’m the managing director in Canada for Porter Novelli, a public relations agency that’s part of the Omnicom Group, a global marketing communications network of companies. I do a lot of corporate communications and reputation management work for clients. And how did your love of opera start? I grew up in Hong Kong where I was first introduced to opera by schoolmates in my early teens. Peer influence, that’s how I got into the genre. I’ve also been singing my entire life. I started in Hong Kong in a children’s choir and then continued throughout high school and college with lessons and more choir. When I went back to Hong Kong, I sang with the Hong Kong Opera Chorus for three years and performed in Otello, Un Ballo, and La Traviata. So opera has always been an important part of my life. Like a lot of opera lovers, Domingo, Callas, Pavarotti — those were my first favourites. The very first LP I bought for myself was the box set of Carmen starring Domingo. I still remember that! Sidebar: I also sang with the Toronto Mendelsohn choir and the Toronto Symphony Orchestra (TSO) with them for 10 years. Recently, when Johannes Debus was conducting their Messiah, I came back as an alumni singer. It was fantastic and he definitely conducted one of the best Messiahs I’ve ever experienced. You can write down that I said that! Going to the opera! I attend quite a few arts and cultural events in my free time. I find it a really good way to unplug. For a couple of hours you have to stay off the grid. You can’t look at your phone (that would be rude! ), so you have to focus on the moment. I also like to visit the TSO and the AGO. What do you love about the opera experience? It’s the most complete form of art. You have the visuals, the music, the emotions, and you have some stories that frankly you don’t want to experience personally. How do you have these cathartic, larger than life experiences? That’s where opera comes in. That’s unfair! There are too many. Let’s start with the COC productions. The Nightingale and Other Short Fables is arguably one of the most visually stunning productions that I have seen, with the water puppets on stage — you can’t beat that one. I’ve always enjoyed the Atom Egoyan Salome; it’s very powerful. And I’m very proud of the COC’s Ring Cycle. It’s very intelligently and intellectually done. It draws out the drama, the emotions, the storyline. All of these operas have made deep impressions on me. Outside the COC, I will never forget a production of Madama Butterfly I saw in Oslo. The whole story was told from the son’s perspective after he’s grown up, and now he’s uncovering the family story. It began with this man on stage going through slideshows and then the slides come to life with the opera’s opening wedding scene. In the last scene before Butterfly kills herself, she embraces her adult son on stage. It was very poignant. As for what I haven’t seen yet, I would love to see Wagner’s Die Meistersinger von Nürnberg live. What compelled you to become a donor? My husband James and I were looking for a place to get married in 2004. I was so annoyed with all the proposals from the regular wedding venue options, so I said let’s do something else. We came to the conclusion that if we were going to spend money on a wedding, we wanted to spend it on an organization that we wanted to support. The COC allowed us to use the Max Tanenbaum Courtyard (at the COC’s Front Street headquarters) for our wedding ceremony and in return we asked all our guests to support the COC as our gift. And then we stayed on and didn’t leave! What’s one of the best things you’ve been able to experience as a donor? Making friends! I’ve made some really good friends through the President’s Council, and that goes beyond just the program. We meet outside of COC events now too. What would you say to someone who’s wary about whether they would enjoy opera? If you like Netflix dramas, then you’ll love opera! People might be afraid because they’re not familiar with the genre and its particular type of singing. If you haven’t grown up with classical music then it can feel very different. You might also have preconceptions about what going to the opera is like — some people worry they’ll get shushed, for example. In Europe the attitude is really quite different — they just see it as a night out. Going to the opera is like going to see a band playing or going to the movies. Whereas we can have such pseudo distinction between what’s art and what’s entertainment, which is a distinction that doesn’t seem to exist in many other countries. But if you like The Crown, then you would definitely enjoy opera. It’s the same kind of melodrama with all the emotions and beautiful costumes. What is it about the arts in general that moves you? The experience is larger than what you can possibly experience individually in your own life. It shows what can be collectively accomplished as a team, with the unsung heroes behind an opera and the hours and hours and decades of training it takes to become an artist. You are witnessing something that has to be undertaken collectively. It’s a massive undertaking. We as audiences play a small but important part. The COC gratefully acknowledges that we have been able to evolve into the innovative arts organization that we are today thanks to our generous donors, sponsors, and patrons. In fact, nearly a third of our operating budget comes from individual supporters who believe that opera can be a meaningful and enriching experience, and that a world with a thriving, artistically vibrant COC is a better world than one without it. Learn more about our community of supporters. Loved hearing about your experiences with opera and singing in Hong Kong and elsewhere generally. Sorry we never see you at the PC lounge but we go on a Tues night and obviously, you don't!